Daughter of a well-respected General, Elizabeth Schuyler is well-versed in the standards of social etiquette. Her family often entertains officers and messengers, but none of them leave as much of an impression as her future husband. Alexander Hamilton, soldier and aide to General George Washington, causes Elizabeth's heart to flutter and never really leaves her heart. She courts Alexander briefly and they marry quickly. Hamilton finds himself devoting more time to work and less to his health, as he becomes an essential part of the government. Hidden from the public eye, Eliza manages the house-hold, calms her husband and helps to stabilize her family. In the capital, she entertains regularly, socializing with the wives of important men while struggling to deal with her own familial issues. Susan Holloway Scott, a bestselling historical fiction author (who's books I've never read before!) created a marvelous novel in this dramatic tale set in the mid 18th Century. Accenting all her writing with slight touches of period-specific references and social mannerisms, she elaborately conveys the story of the hidden woman behind a great man. Eliza's character was strongly defined throughout the novel. Starting off as a timid young lady simply looking for love and a marriage and ending as a confident, independent lady who had witnessed it all, she was an ever-changing, dynamic character throughout the novel. The struggles she deals with are so vividly described that they brought fresh tears to my eyes. I am rarely compelled to feel as emotional as a writer may want me to, but Scott did a great job with synthesizing sensitivity into fact. What stung me more was how normal so many of these issues were considered at the time, causing me to marvel at how far we'd come as a society. While I did take some time to read this book, I believe it was only because I know next to nothing- or rather knew next to nothing- about the American Revolution before reading this book. I love history though, so I welcomed a chance to merge my love for reading and history and learn about a new topic of history. I was slightly confused for the first few pages of the book, but the rest of the book was quite easy to follow in terms of historical facts. They are all self-explanatory, and are elaborated upon as the author depicts Alexander's political and personal positions on the contemporary events. Even if you don't know much about American History, you're definitely going to enjoy this book! 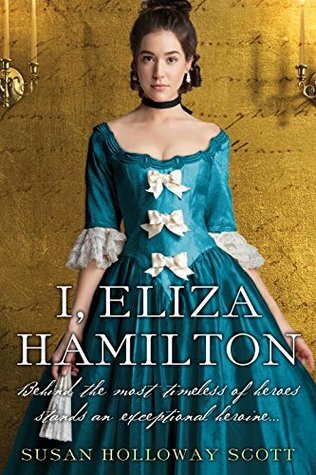 "I, Eliza Hamilton" is a story of love, heartbreak, tragedy, loss, revolution, recovery that will touch readers, regardless of their love or hate for history.